As our way of celebrating the end of our first year, kaDON is giving away a 2-Cho-Gake Roped Shime Daiko made by Miyamoto Unosuke Shoten to our subscribers! Please read the contest rules below and get creative! Happy Holidays!! Prize: One (1) contest winner receives a 2-Cho-Gake Roped Shime Daiko by Miyamoto Unosuke Shoten (retail value: $1,200 USD). Open to subscribers of kaDON.com. Entrants must be a subscriber at the time of entry and at the time the contest ends on 12/28/2014. Contest deadline is 12/28/2014 at 11:59pm PST. One (1) winner will be announced via our eNewsletter, on our Facebook page, and on kaDON.com on New Year’s Day 2015! You must answer five multiple-choice questions about our courses and submit a short essay or a video message for a bonus question. A person with correct answers to all of the multiple-choice questions and the most creative answers to the bonus question will be chosen as the winner! Your essay or video message may be used for marketing purposes. 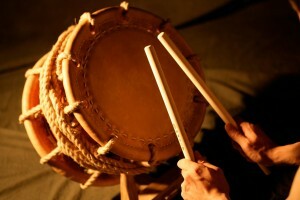 The winner will pay $30.95 USD for shipping and handling of the Shime Daiko (for US address only. International winner may be subject to additional shipping charges). The winner will be notified privately and will be required to submit personal information necessary per IRS (Internal Revenue Service) regulations.